Western blot analysis of extracts from various cell lines using FoxP1 (D35D10) XP® Rabbit mAb. 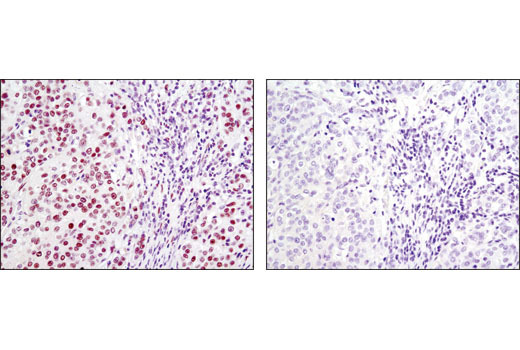 Immunohistochemical analysis of paraffin-embedded human breast carcinoma using FoxP1 (D35D10) XP® Rabbit mAb in the presence of control peptide (left) or antigen-specific peptide (right). 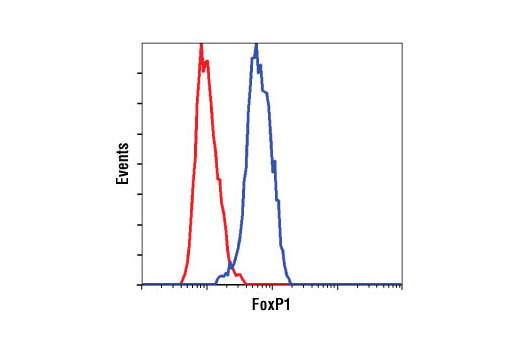 Flow cytometric analysis of MOLT-4 cells using FoxP1 (D35D10) XP® Rabbit mAb (blue) compared to a nonspecific negative control antibody (red). 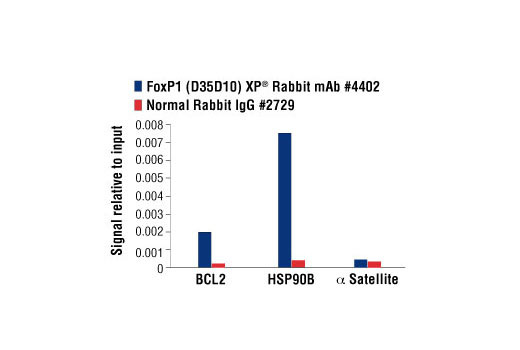 Chromatin immunoprecipitations were performed with cross-linked chromatin from Raji cells and either FoxP1 (D35D10) XP® Rabbit mAb, or Normal Rabbit IgG #2729, using SimpleChIP® Enzymatic Chromatin IP Kit (Magnetic Beads) #9003. The enriched DNA was quantified by real-time PCR using SimpleChIP® Human BCL2 Promoter Primers #12924, SimpleChIP® Human HSP90B1 Promoter Primers #12899, and SimpleChIP® Human α Satellite Repeat Primers #4486. The amount of immunoprecipitated DNA in each sample is represented as signal relative to the total amount of input chromatin, which is equivalent to one. 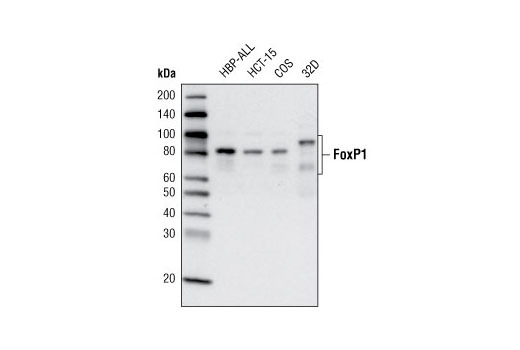 FoxP1 (D35D10) XP® Rabbit mAb detects endogenous levels of total FoxP1 protein. Monoclonal antibody is produced by immunizing animals with a synthetic peptide corresponding to residues surrounding Leu584 of human FoxP1 protein. FoxP1 plays an important role in cardiac valve and B cell development. Targeted deletion of FoxP1 in mice results in embryonic death at E14.5 with severe defects in cardiac outflow development, endocardial cushion morphogenesis, and myocyte proliferation and maturation (6). The FoxP1 gene is located on chromosome 3p14.1 and loss of heterozygosity of this region in multiple cancer types suggests a role for FoxP1 as a tumor suppressor (7). Alternatively, FoxP1 may also act as an oncogene as it is highly expressed in a variety of B cell malignancies and is frequently involved in chromosome translocation (8,9). Wang, B. et al. (2004) Development 131, 4477-87. Banham, A.H. et al. (2001) Cancer Res 61, 8820-9. Wlodarska, I. et al. (2005) Leukemia 19, 1299-305. Goatly, A. et al. (2008) Mod Pathol 21, 902-11.